As a kid I remember celebrating New Years by marching out into the street with my grandparents and all of the neighbors to bang on pots and pans. I am not sure my neighbors would appreciate this! (even if it is just the four of us), a nice dinner, a special dessert, and being comfy. my sweet friend June came to visit one New Years Eve. 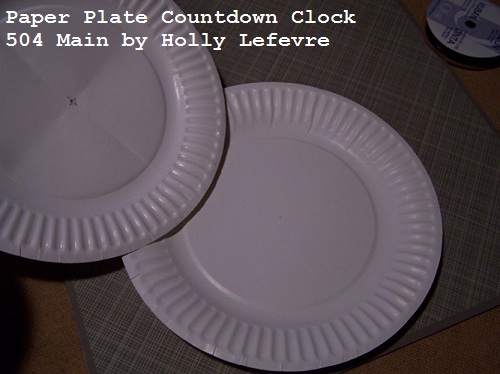 and she had the brilliant idea to make these clock out of paper plates. We hung them on the tree and hung them from the ceiling. This is a SUPER SIMPLE AND EASY CRAFT! except for maybe the cheapo paper plates. and then can decorate anyway they want. But to get started here is how to do it. String, ribbon, yarn for hanging. 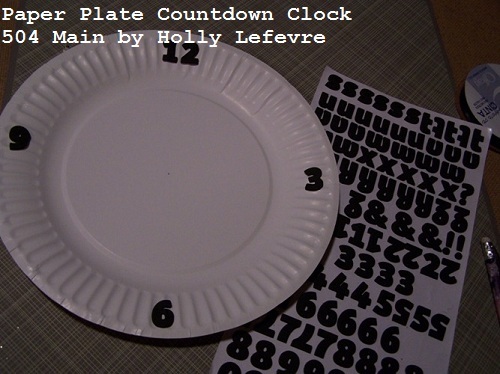 For the numbers: Number stickers, pom poms, buttons, or a Sharpie to draw your own numbers. Of course any fun thing you can think of or have around the house will do. 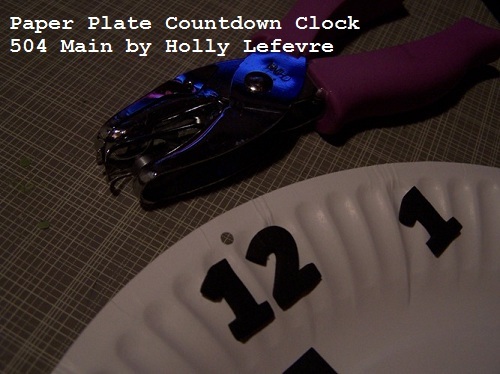 Or cut numbers with an electronic craft cutter or die cutter. You need 5 "1's"- be aware that most sticker packs do not have 5 "1's." 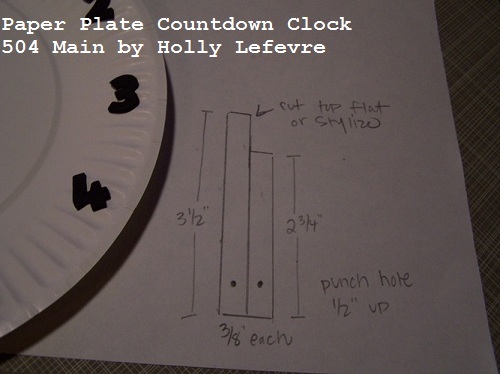 Determine the center of a paper plate - I folded one in half and then in half again and punched a hole to use as a template for the other clocks. Place your numbers: I started by placing the 12. 3, 6, and 9 in their places and filled in with the other numbers. I eyeballed the placement...you could measure. If you are using something other than stickers or numbers, you need to glue them down in this step. I used Elmer's Glue for my pom poms and buttons. See my note in supplies if you are using ink and drawing the numbers. Cut 3/8" strips of black paper and then cut pairs of hands. My large hand is 3 1/2" and the small hand is 2 3/4". I kept my ends straight but you can cut them in to points or whatever suits your fancy. Punch a hole about 1/2" up from the bottom on each hand. Insert the brad through the holes on the hands, with the small hand on top. Insert brad through the center hole and spread on the back. Punch a hole centered over the 12. 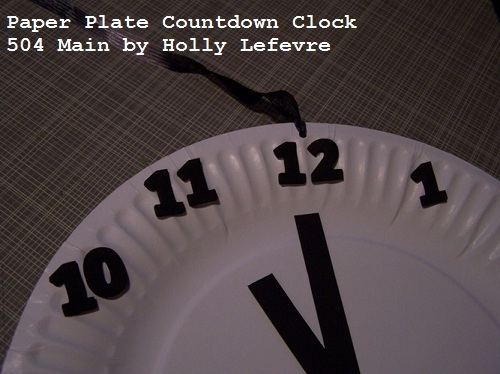 OR you can tape the string to the back of the plate. String the ribbon, etc. through this hole and tie off. 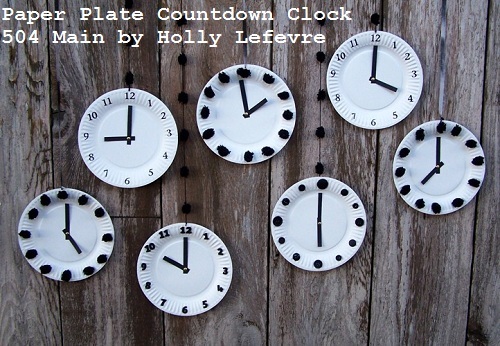 and fun clocks to decorate and celebrate the New Year! 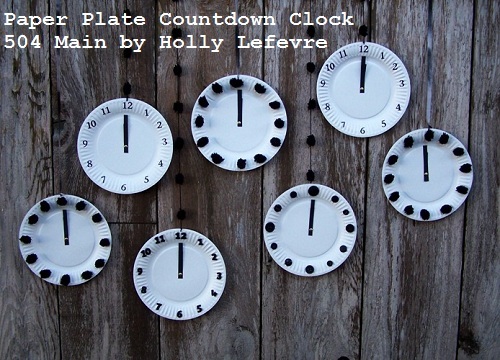 The hands move and my kids like to change the time with the hour. 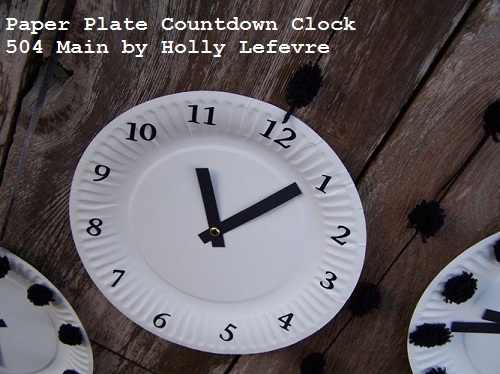 We also display the different time zones on the clocks. I hang these from the ceiling using command adhesive strips or on a wall. 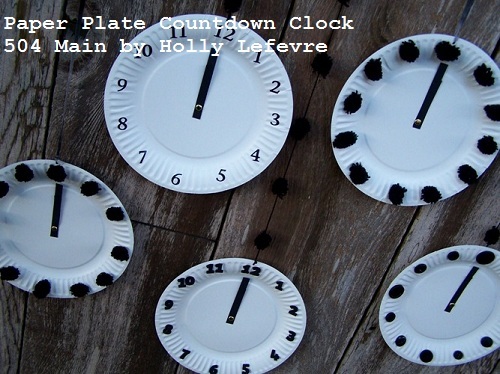 You can also make the clock double sided by gluing completed clocks together. Now...I just want to end by wishing a BIG OLE HAPPY NEW YEAR to you all. 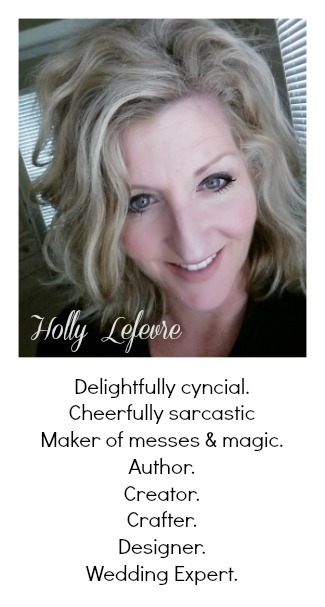 I appreciate you visiting and reading and all of your creativity! Cute project and Happy New Year to you. Happy new year, Holly. I hope it brings everything you wish for. 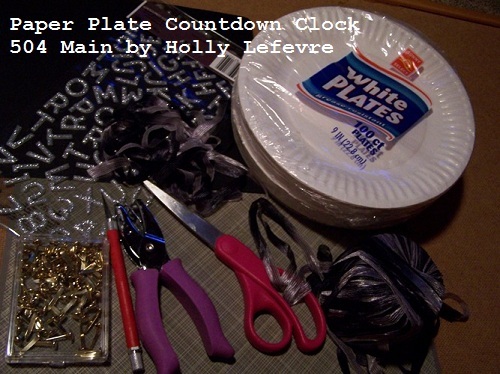 You are saving me tonight, Holly, with this craft. I have 7 kids to keep occupied...7! Thank goodness for you, June and paper plates. Happy New Year's my friend. I know it will be an amazing year for you and your family! 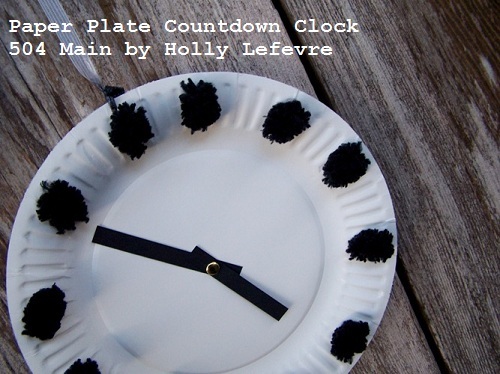 As always Holly your project is fabulous! 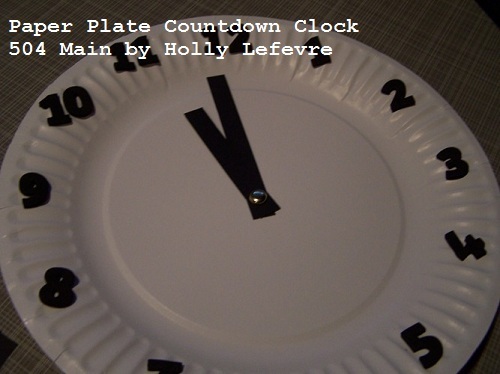 Posted on my blog today along with 17 other activities for kids. Happy New Year!